Short stay, high service/ low price, well maintained/equipped, in center. Comfortable studio, 2 adults, Dutch owners. This beautiful furnished and well maintained studio is located on the second floor. The apartment has an open plan kitchen, living room and bedroom. The living room / bedroom area has two single beds fitted with comfortable box spring mattresses, duvets and pillows. Two sets of satin sheets, duvet covers and pillow cases are available for free in this condo. Original art from Thai artists. The kitchen area is equipped with one hotplate, rice cooker, coffee maker, kettle, toaster, microwave oven and fridge with freezer compartment. Crockery, glassware, cutlery and pots and pans are available to cook and eat a small meal. Kitchen linen, coffee, creamer and sugar is provided for free. The bathroom has a shower cabin, a toilet and a wash basin with ample space for your toiletries. Hand soap, soap, toilet paper, big size towels, bathrobes and hair drier are available. The balcony has garden furniture, ceiling fan and sun screen. The studio has air con, electronic safe and fly screen. Additional services: In advance or while you are staying in our studio we can provide several services. The next services are available. On request we can provide disabled and elderly people with some medical equipment. We have available a foldable shower chair, a toilet seat raiser and movable grips. For more information and/or prices please contact us by email. We visit our apartment two or more times a year to keep up the quality. When needed we replace, refurbish or repair. We take pride in the quality and cleanliness of the studio. We provide you with personal service to ensure a perfect stay in our condo. Jazz festival, Songkran, Loi Kratong, Chinese New Year, Kite festival, Vintage car rally, Hua Hin Regatta, Hua Hin triathlon, golf festival, horse festival. english, french, german, dutch, In writing every language. Google Translate. This studio has one bathroom equipped with a toilet, shower enclosure and wash basin. It has ample space to put down toiletries. Soft big size bath towels, small wash basin towels are plenty available. Bathrobes, Hair drier, soap, hand soap and toilet paper will be present upon arrival in this holiday condo. For elderly and disabled guest are a toilet seat raiser, grips and shower chair available on request. This studio is wheelchair accessible. The bathroom is only accessible for people who can walk a few steps. We can provide our guests with a foldable shower chair, movable grips and toilet seat raiser for a small extra fee. Please request these aids together with you reservation. We have been to other parts of Thailand but this was our first visit to Hua Hin and we were not disappointed. . Henneke (one of the owners) showed us round the apartment and was generally very helpful and on hand if we had any problems (which we didn't). The studio is on the first floor, is spotlessly clean and has everything you could possible need for a comfortable stay. We quite liked the fact that there was a fly screen so you could have the balcony door open at night without the worry of insect bites. The studio is right in the centre of town where there are numerous fabulous restaurants and is about 20 minutes walk to the beach. The staff within the complex are faultless, very helpful and nothing was too much trouble. 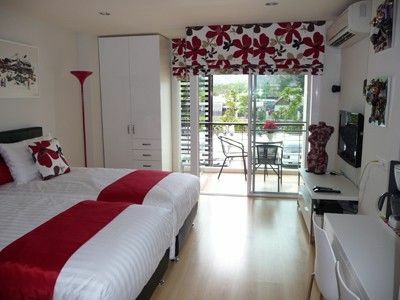 We would certainly recommend Studio 74 for a great holiday in Hua Hin. Thank you so much for your kind review. It was very nice to welcome you as our guest and to meet you in person. And although you never travel to the same spot twice (like you told us in a previous email) we do hope we meet again. Maybe in Hua Hin. We also enjoyed the location of the studio for two weeks just before you. And yes the staff of Tira Tiraa is very kind and helpful. It was very comfortable and convenient, it was in the heart of town, close to anything you could possibly need, a bit far from the beach (about a 5 min walk) but it also had a great pool so it wasnt a big deal. The building also had laundry service which was really conveniant. Thank you very much for your review. We loved to have you and we hope to see you again in Hua Hin. Studio74 is conveniently located in the center of Hua Hin. The white sandy beach with sunbeds and umbrellas, beach bars and and beach restaurants is the main attraction of Hua Hin. Horse back riding, jet skiing, banana boat riding and kite surfing are just a few activities on the beach. Supermarket, ATM, shops, restaurants, pubs and bars are all located within walking distance. Several local tourist attractions like elephant village, cultural dinner show, kick boxing arena and lady boy show are within a 5 minutes Tuk Tuk drive. Local fresh markets are located around the corner. And the famous tourist night market with several very good seafood restaurants are within walking distance. Golf: In and around Hua Hin are 9 golf courses. The Royal Hua Hin Golf course is within walking distance, 500 meters of the apartment. A Scottish railway engineer named of O.A.Robins designed the first golf course of Thailand. Opened in 1924 the Royal Hua Hin Golf Course offers tempting Tee shots for the adventurous & natural jungle surroundings, as well as views over the gulf of Thailand, making this course a must for any golfer staying in or near Hua Hin. It is a 18 holes Par 72 golf course and the length is 6,678 yds. Facilities available are driving Range, chipping greens, putting green, pro shop, restaurant, club hire and electric arts. At local tourist agents golf tours can be booked to all golf courses. Range lessons and 9 holes playing lessons possible at several golf courses.